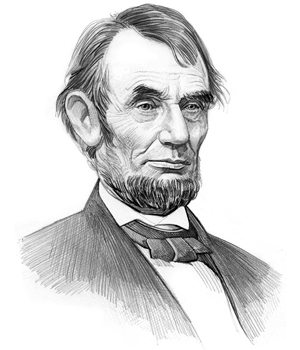 Summary of President Abraham Lincoln for Kids: "Honest Abe"
Summary: Abraham Lincoln (1809-1865), nicknamed the "Honest Abe", was the 16th American President and served in office from 1861-1865. The Presidency of Abraham Lincoln spanned the period in United States history that encompasses the events of the Civil War Era. President Abraham Lincoln represented the Republican / National Union political party which influenced the domestic and foreign policies of his presidency. The attack on Fort Sumter sparked the Civil War. The major accomplishments and the famous, main events that occurred during the time that Abraham Lincoln was president included the attack on Fort Sumter and the start of the Civil War (1861 - 1863), the Emancipation Proclamation (1863), the Conscription Act (1863) and the Gettysburg Address (1863). Other main events included the Ten Percent Plan, the 1862 Homestead Act, the 1863 Proclamation of Amnesty and Reconstruction and the establishment of the Freedmen's Bureau. General Robert E. Lee surrendered to General Ulysses S. Grant on April 9 1865 and the Civil War ended. President Abraham Lincoln was assassinated by John Wilkes Booth on April 14, 1865 and the famous president died on April 15, 1865, aged 56. The next president was Andrew Johnson. The summary and fact file of Abraham Lincoln provides bitesize facts about his life. The nickname of President Abraham Lincoln provides an insight into how the man was viewed by the American public during his presidency. The meaning of the Abraham Lincoln nickname "Honest Abe" refers to his integrity and trustworthy nature - in his early years he had earned this reputation by returning money to customers who had accidentally overpaid him. The meaning of his nickname "Rail Splitter" was a reference to his humble beginnings working on a farm and his reputation as a 'man of the people'. The character traits of President Abraham Lincoln can be described as hard working, humorous, logical and witty. It has been speculated that the Myers-Briggs personality type for Abraham Lincoln is an INTP (introversion, intuition, thinking, perceiving). A modest, reserved, stoic character with a preference to work informally with others as equals. Abraham Lincoln Personality type: Quiet, analytical, impatient and thoughtful. The accomplishments of Abraham Lincoln and the most famous events during his presidency are provided in an interesting, short summary format detailed below. For additional interesting facts and articles refer to our separate Civil War website. Summary of the Lincoln-Douglas Debates: The Lincoln-Douglas Debates were a series of seven public debates between Republican Abraham Lincoln and Democrat Stephen Douglas that concerned the issue of slavery and the extension of slavery into territories such as Kansas. The Lincoln Douglas debates transformed Abraham Lincoln into a national figure and helped him win the presidential election in 1860. Summary of the Trent Affair: The Trent Affair was a serious diplomatic incident that occurred on November 7, 1861. The Trent Affair nearly sparked a war with the British when two Confederate diplomats, James Mason and John Slidell, were taken from the British mail ship, the RMS Trent, by Captain Wilkes of the USS San Jacinto. Summary of the 1862 Homestead Act: The Homestead Act was signed by President Abraham Lincoln on May 20, 1862 during the Civil War (1861-1865), following the secession of the Southern states. The Homestead Act was "An Act to secure Homesteads to actual Settlers on the Public Domain". The Homestead Act enabled 270 millions acres, or 10% of the area of the United States, to be claimed and settled by American citizens. Summary of the Emancipation Proclamation: The Emancipation Proclamation was made by Abraham Lincoln and formally issued as presidential proclamation on January 1, 1863. It was introduced as a war measure during the Civil War freeing the slaves in those territories still in rebellion against the Union (the Confederate States of America). By issuing the Emancipation Proclamation the Civil War, that had initially started to preserve the Union, became a revolutionary struggle for the abolition of slavery. Slavery was eventually banned throughout the United States by the 13th Amendment which was ratified on December 6, 1865. Summary of the Proclamation of Amnesty and Reconstruction: The 1863 Proclamation of Amnesty and Reconstruction was made by Abraham Lincoln on December 8, 1863 offering pardon to Confederates who would swear to support the Constitution and the Union. Summary of the Ten Percent Plan: The Ten Percent Plan was devised by President Abraham Lincoln in order to reunify the North and South after the end of the Civil War. The moderate Ten percent Plan required 10% of seceded state voters take oath of loyalty to Union, to create a new state government and to adopt a new constitution abolishing slavery. Summary of the Wade-Davis Bil: The Wade-Davis Bill was in opposition to President Lincoln's lenient Proclamation of Amnesty and Reconstruction and his Ten Percent Plan and was pocket vetoed by President Abraham Lincoln and never took effect. Summary of the Gettysburg Address: The Gettysburg Address was a short speech given on November, 19, 1863 by President Abraham Lincoln at the dedication of the National Cemetery at Gettysburg, Pennsylvania to commemorate the massive numbers of deaths and casualties at the Battle of Gettysburg that was fought July 1–3, 1863. The Gettysburg Address consisted of just 270 words and took just over 2 minutes to deliver. Summary of the Freedmen's Bureau: The Freedmen's Bureau was a federal agency established on March 3, 1865, just before the end of the Civil War, to help emancipated slaves (freedmen). The Freedmen's Bureau performed relief work for poor black and white people in war-stricken areas in the South, regulated working conditions and provided support for education of freedmen. Summary of the Assassination of Abraham Lincoln: The Assassination of Abraham Lincoln took place on the evening of April 14, 1865 at Ford’s Theatre in Washington, D.C. The assassination was perpetrated by John Wilkes Booth a Southern sympathizer. President Abraham Lincoln died the next day and was pronounced dead on April 15, 1865. His assassin, John Wilkes Booth, escaped on the night of the assassination but was cornered 12 days later May 10, 1838 in Bel Air, Maryland where he was shot dead by a Union soldier. The article on the accomplishments of Abraham Lincoln provides an overview and summary of some of the most important events during his presidency. The following Abraham Lincoln video will give you additional important history, facts and dates about the foreign and domestic political events of the administration of Abraham Lincoln.